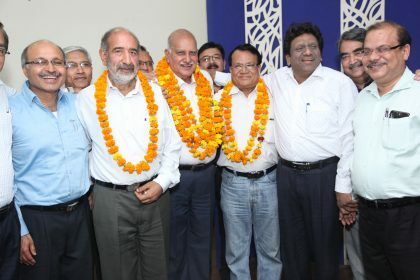 New Delhi: Dr Arvind Chopra from IMA Central Delhi Branch was unanimously elected Hony State Secretary Delhi Medical Association in an election held on 28th March 2019 along with Dr Ashok Aggarwal from Delhi North Zone as HonyFinance Secretary for the year 2019-20. The new office bearers will take over the office of Delhi Medical association from 1st April 2019 under the leadership of President Dr Girish Tyagi, President-Elect Dr B.B. Wadhwa along with Dr Ashwani Dalmiya and Dr Puneet Dhawan as Vice Presidents for the year 2019-20. Delhi Medical Association is the biggest platform of doctors of medicine in the capital and is involved in various activities including mass-scale vaccination, health checkup camps, measles and pulse polio programmes Blood donation camps, Anti Quackery movement, conference et. DMA has totally decentralized all its activities to all its thirteen branches spread all over Delhi and works intensively health policies and other issues of Delhi Govt., National & International health agencies and health associations.